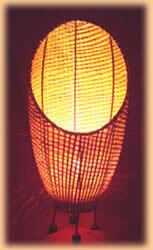 Made from Coconut leaves and standing a little under two feet in height (c. 55cm), this model is supplied with the FireLamp to be fitted inside by the Client. The firelight flickers around the inside of the leaves and on the ceiling above. 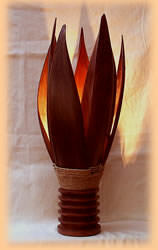 The flame effect is quite discreet, with the tip of the flame seen through the spaces between the leaves. As with the CoCo, this model is hand-made in Indonesia from natural woven fibres. The semi-open weave of the lamp allows diffuse flamelight to dance about adjacent walls, whilst the flame flickers within. Again, quite a discreet flame effect. 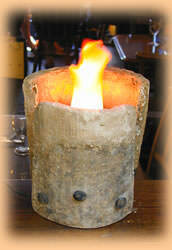 A foot and a half high (without the flame), this model is in the style of a crucible on a pedestal frame. About a foot high and identical to the Roman in effect but housed in a black with brushed gold vase. Two halves of an antique Spanish roof tile with decorative iron bolts. Raised rear tile shows off the flame colours of the lamp with flickering flamelight falling on surrounding walls and ceiling. A stylized representation of a burning brazier, about a foot high, 5" in diameter and available in black or brushed chrome. 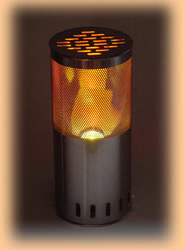 Good light output in true fiery colours with multiple flame effect through use of reflective film.